Reckoned amid one of the credible market names, we are willingly betrothed in offering to our patrons Non Leather Conference Folders. We present a wide spectrum of Presentation Folders for presentation purposes. Whether you use them for conference handouts, product literature, business proposals, or press kits, presentation folders will serve to promote and enhance the professional image of your company. Keeping in mind the diverse requirements of the clients, we offer our clients an extensive array of Presentation Folder. These are available in various specifications as per the client’s requirements. We offer these in market at feasible prices and are appreciated among the clients for their long life and durability. A folder not only presents your proposal/project's important materials, it reinforces your name recognition and builds brand identity. Whether it's simple, elaborate or just plain - it is the image you want to project is there for your clients to see. And we help you to create the right one. We are devoted towards providing the qualitative range of Presentation Folders. 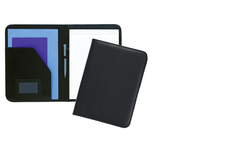 We present a wide spectrum of leather folders for presentation purposes. They have secured a major market pertaining to their light weight nature along with a tough durability. Having made from premium quality leather they are very comforting.We offer the products within a very appropriate cost price.